50 states. 4.12 million miles of road.1 More than 2.6 million miles of highways and paved roads, 94 percent of which use asphalt.2 With such a significant impact, asphalt producers and contractors keep this country up and running. This makes the work they do, and the equipment they do it with, critical to safety and operational efficiency for all forms of transportation. There’s no time for equipment-related issues that could potentially halt production. That’s where tires and tire management technologies come into play. 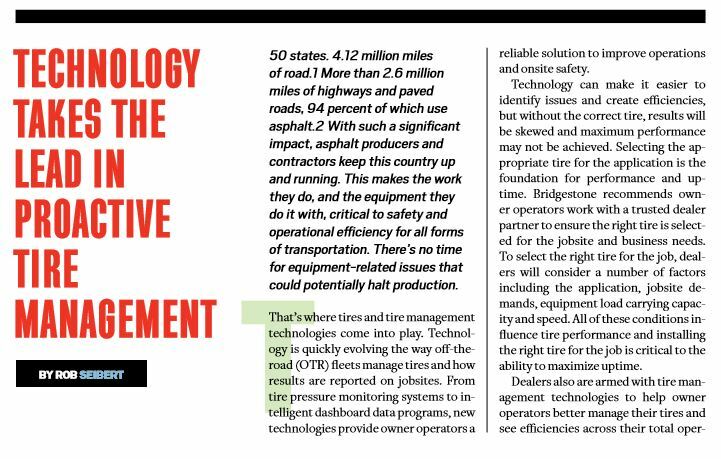 Technology is quickly evolving the way off-the-road (OTR) fleets manage tires and how results are reported on jobsites. From tire pressure monitoring systems to intelligent dashboard data programs, new technologies provide owner operators a reliable solution to improve operations and onsite safety. Technology can make it easier to identify issues and create efficiencies, but without the correct tire, results will be skewed and maximum performance may not be achieved. Selecting the appropriate tire for the application is the foundation for performance and uptime. Bridgestone recommends owner operators work with a trusted dealer partner to ensure the right tire is selected for the jobsite and business needs. To select the right tire for the job, dealers will consider a number of factors including the application, jobsite demands, equipment load carrying capacity and speed. All of these conditions influence tire performance and installing the right tire for the job is critical to the ability to maximize uptime. Tire and rim management platforms analyzed and presented data in an actionable by compiling tire performance data into customizable dashboards. Photos courtesy Bridgestone Americas Tire Operations. Dealers also are armed with tire management technologies to help owner operators better manage their tires and see efficiencies across their total operations. They are focused on understanding and interpreting data on tire pressure and temperature to make adjustments in real time to keep moving the business forward. Solutions like tire pressure monitoring systems (TPMS) and tire management and maintenance systems, along with a trusted dealer partner, can work together to help make mobility more efficient on jobsites by delivering improved productivity. Safety on the jobsite is a top priority for owner operators. Technology has become a conduit for real-time tire performance reporting and enables owner operators to address issues before they result in unplanned downtime or unsafe operating environments. For OTR tires, the key performance indicator is tire pressure. Tire pressure helps ensure a vehicle’s weight is evenly distributed to avoid rapid treadwear and heat build-up at one or more wheel positions. TPMS alert operators to pressure problems before they become serious and costly. By integrating TPMS into a vehicle, operators can closely track tire pressure in real time to receive in-cab alerts when tire pressure is below recommended levels. TPMS also can reduce the amount of time spent on tire inspections by up to 75 percent by eliminating manual data entry into logbooks. A technology-driven data gathering process helps ensure data is recorded efficiently and correctly each time. 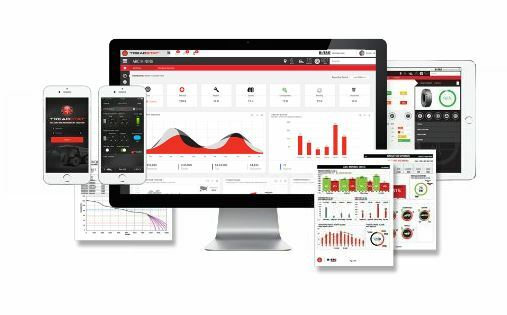 The Bridgestone TreadStat™ Tire and Rim Management Platform integrates via Bluetooth with the PressureState™ tire pressure monitoring system to make analytics accessible from a user’s computer, tablet or smartphone for remote monitoring. Data itself is not enough. Once data is collected, it must be analyzed and presented in an actionable way. Tire and rim management platforms do this by compiling tire performance data into customizable dashboards. These dashboards are rich with insights on the inflation pressure and temperature for each tire on a jobsite and help operators maximize tire use, manage inventory and costs, and improve safety. For example, the Bridgestone TreadStat™ Tire and Rim Management Platform gives owner operators the ability to forecast and check the status of tires and rims from anywhere in the world with their mobile device. 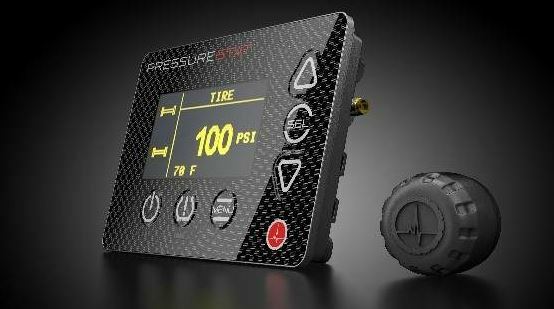 The platform integrates via Bluetooth with the Bridgestone PressureStat™ tire pressure monitoring system and makes analytics accessible from a user’s computer, tablet or smartphone for remote monitoring. As technology evolves and further integration occurs, owner operators are able to shift to a predictive maintenance model, forecasting when to service tires. This enables owner operators to better control costs and be proactive instead of reactive when it comes to tire maintenance and management. Rob Seibert is director of marketing, off-the-road (OTR) tires, commercial group, Bridgestone Americas Tire Operations (BATO) where he leads all marketing research, planning and execution for OTR tire business in North America. Seibert also manages the strategy development and execution of special projects aimed at advancing the organization’s global OTR solutions offerings.